Set to return for its third season this fall is Fox's family comedy Raising Hope. Fox released a first look video, which gives us a peek at what's ahead for the Chance family, and includes some glimpses of mother-daughter duo Melanie Griffith and Tippi Hedren, who are set to guest star in Season 3. Spoilers ahead! "Your grandmother is dead. We should be celebrating," Tamara says. We should have known a funeral story arc wouldn't necessarily mean sad times ahead for Raising Hope. If anything, this seems more to do with Sabrina's relationship with her mother (and probably the money they stand to inherit). 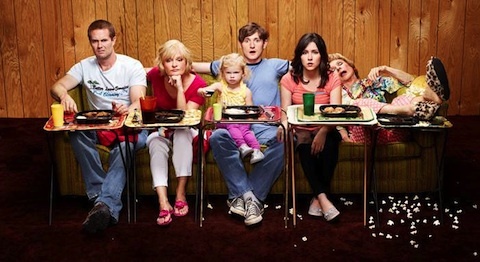 While we're on the subject of Raising Hope, here's the Chance family photo for Season 3! It's TV dinners for everyone! Kind of reminds me of the Heck's family photo for Season 3 of The Middle. Except here, Maw Maw's made a mess. Raising Hope returns for Season 3 Tuesday, October 2 at 8/7c.